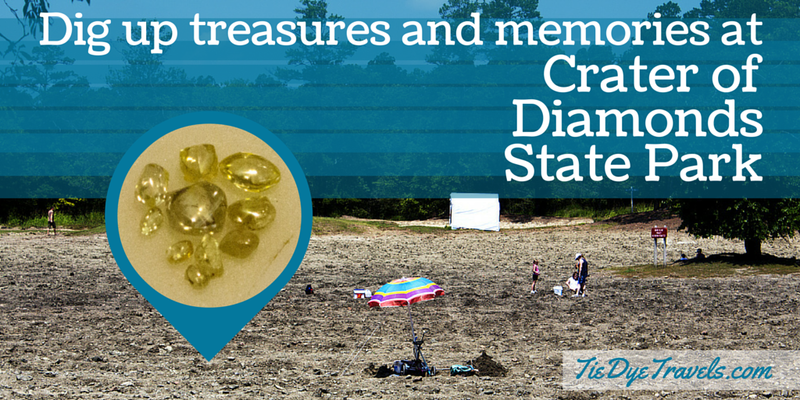 Dig Up A Fortune of Memories at Crater of Diamonds. 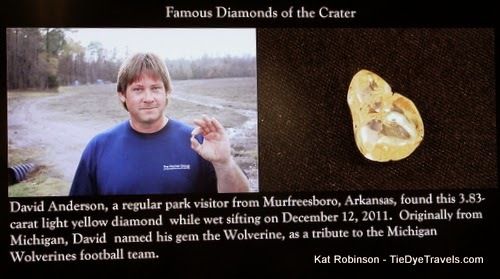 The best time to find diamonds at Crater of Diamonds State Park in Murfreesboro, Arkansas is right after a good rain. But you're more likely to see the fields full of prospectors and would-be fortune finders on a sunny day. The smart ones take umbrellas or sunshades, water and provisions, and the veterans have an eye for that perfect bright sparkle. Way back in 1906, a farmer by the name of John Wesley Huddleston was turning over the soil on his land and saw that glint. He shared news of his find in the furrows of his field, and the area caught diamond fever. The neighbor next over, Millard Mauney, also turned out to have diamonds on his plot, and the frenzy exploded. Mauney jumped to take advantage of that, got together a land development deal and the town of Kimberly was born. You won't find Kimberly on the map these days. Incorporated in 1908, it was to be funded by the revenues from a genuine, bona fide producing diamond mine. A good idea, but all dependent on those diamonds. Commercial testing was done, the diamonds proved to be elusive, and by 1911 the development at Kimberly was done. But that wasn't the end of the story. Sure, some commercial interests couldn't find a footing, but a couple did, and the Ozark Diamond Mines Corporation and the Arkansas Mining Company spent some 40 years between the two to see what else they could dig up off the top of the Prairie Creek Pipe that ran through the area. And individuals still found diamonds from time to time. In fact, a 40.23 carat diamond was found by one Wesley Basham (who worked for the Arkansas Diamond Company) in 1924... the famed Uncle Sam, the largest diamond ever found in the United States. So mining diamonds for commercial endeavors never really paid off well. But the idea of being able to find a diamond was intoxicating, and the Ozark Diamond Mines Corporation decided to take advantage of that, opening some of its land to would-be prospectors as a tourist attraction back in 1952. 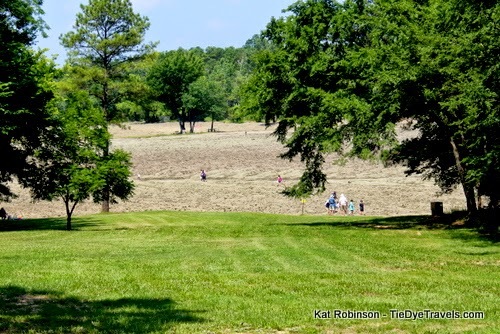 They called their site the Crater of Diamonds, and for 20 years this private venture charged a small fee for people to come out and see what they could dig up. 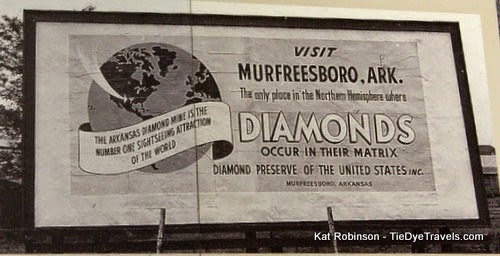 Several large diamonds were found, including the 34 and a quarter carat diamond, Star of Murfreesboro, back in 1964. You and I both could agree, I'm sure, that diamonds are a natural resource... and so did the state of Arkansas. In 1972, the state purchased the attraction and established the Crater of Diamonds State Park. To this day, more than 70,000 diamonds have been discovered on the site since John Huddleston's first find in 1906. 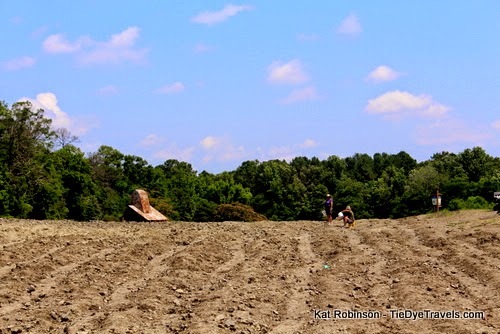 When I talk about things everyone talks about needing to do in Arkansas, things that are on their Bucket List, I invariably hear "I need to go dig for diamonds." Growing up I'd hear people on TV talking about their chance to win the lottery -- but here in Arkansas, there was no lottery, and the only real equivalent was finding a large diamond. The idea of diamonds in our state saturated it from border to border so quickly, that when Willie Kavanaugh Hocker of Wabbaseka created her contest-winning design for the state flag, she incorporated a diamond into its design. But what's it like? 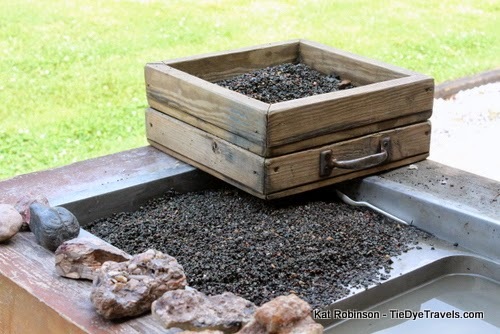 Certainly it's nothing like panning for gold in California or Colorado? Or like digging for silver underground in the Rockies? Nope, it's something a bit different, and fortunately for all of us it's relatively easy, relaxing and fun. Unless you forget your sunscreen, of course. Crater of Diamonds State Park is a rather nice place south of Murfreesboro. There's a great RV section on park for those who wish to stay there. There are wildlife watching areas and a great visitors center. But of course, you're wanting to know about digging up some of those diamonds for yourself. visitors center, and see real diamonds unearthed at the park. There's also a video presentation going that showcases many of the neat diamonds found at the park over the years. You'll learn about the history there (more than what I've shared, of course, and if you want to read more right now, you can go here) and pick up tips on spotting stones. There aren't just diamonds out there... there are also garnets, peridot, jasper, quartz and amethyst in the field, and they're also great souvenirs. pet, though your dog can't go into the visitors center unless it's a service animal. Hey, if you've trained a dog to dig diamonds successfully, give me a holler because that's a story I want to share! Don't have tools to dig? The park offers several items for rent, including a kit ($8 rent plus $35 deposit) that includes a bucket, shovel and screen. So you can get in cheap, you have tools... but how do you actually go about finding a diamond? 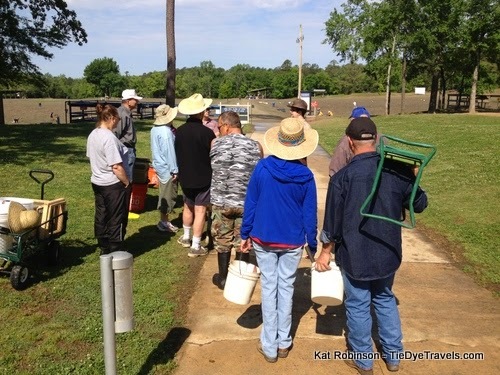 Park employees, such as park interpreter Margi Jenks, are on-hand with demonstrations to show you how it's done. 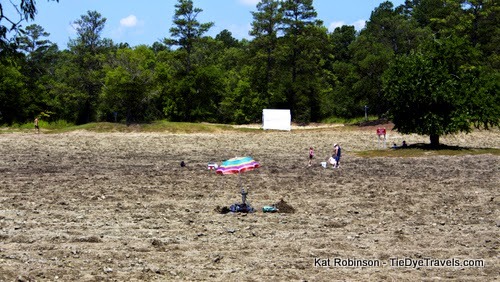 surrounding soil has been washed away. But diamonds are found on all sorts of days -- hot or cold, rain or shine, anytime except dead of night (which, of course, isn't possible anyway since the park is closed). shade. If you bore easily, bring a headset and listen to music or books on tape. 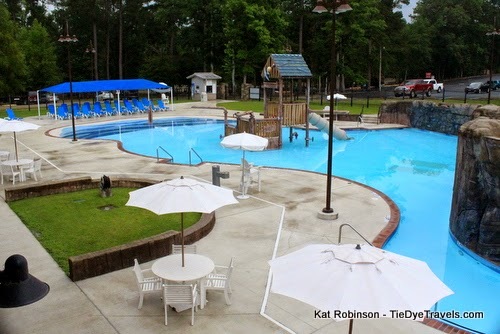 Diamonds has a lovely little water park,Diamond Springs, right off the 37.5 acre field to cool off in... after you've showered, of course. That's the other thing. You don't want to wear your Sunday best. 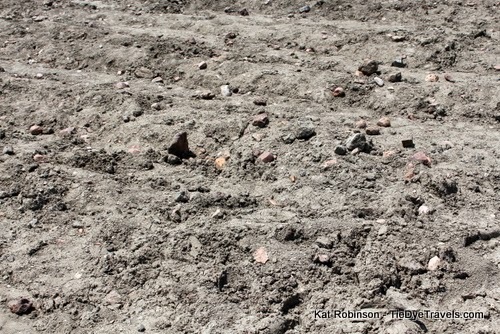 For heaven's sake, you're going to be digging in the dirt -- dress appropriately! And when you're done with your dig and can't dig any more, take advantage of this one secret... you're allowed to take one bucket of soil from the park home with you. 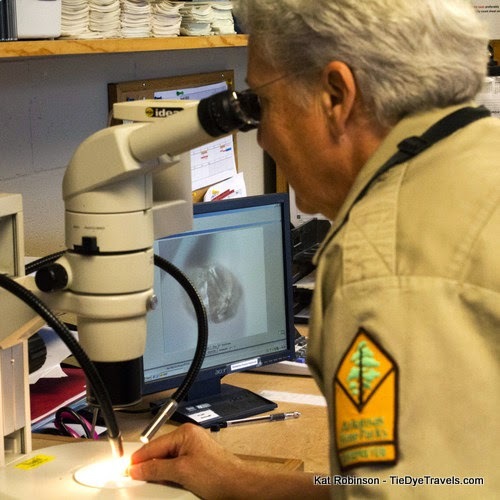 In fact, many of the park's big finds occur this way -- with individuals getting a chance to dig for diamonds in the comfort of their own home or garage at their own leisure. Just keep this in mind... there are over 100,000 visitors to Crater of Diamonds each year... and an average of two finds a day. Those diamonds are usually under a carat, though occasionally a two or eight carat stone is found. You probably won't find one that will pay off your mortgage, but you will have a good time, especially if you go with friends or family. And aren't memories the best souvenirs anyway? 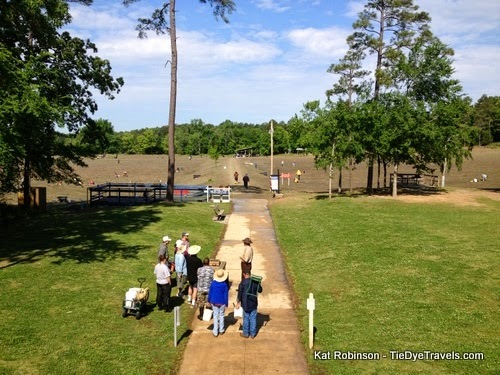 Going to digging for diamonds is on my Arkansas Bucket List too. I think it would be a fun experience for my whole family and I would be overjoyed if I actually found a diamond. I brought my dog along a few years ago to try this! Alas, he was not good at all at finding any diamonds. :-) It was right after big rains, so VERY muddy (and felt a bit like quicksand). Still, lots of fun. 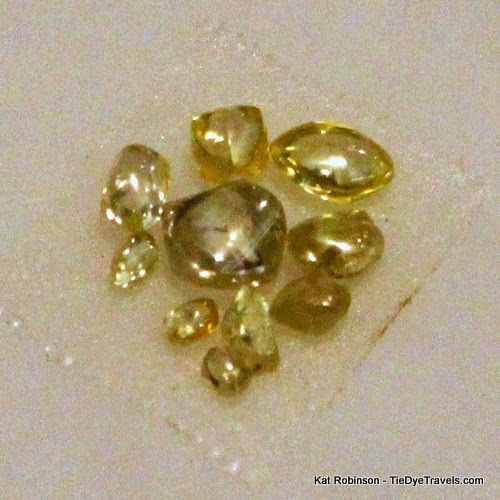 I wrote about our experiences here: http://travelbrowsingwithdeb.com/digging-for-diamonds-in-arkansas/ Thanks for sharing your tips! This isn't too far from us, yet I have never been! We have it on our bucket list for places to go camping with the kids though. I know my kids will love it.